Left to right: Sarah Bridges, Sheuvaun Vernon (BurgherGray), Nancy Chambliss (Harrell & Chambliss), Thomas O’Dea, Amy Williams, Sandra Honegan-Pounder (BurgherGray), Rudene Haynes, Gopal Burgher (BurgherGray), Natalie Mariani and Freddy Chang. New York, NY. 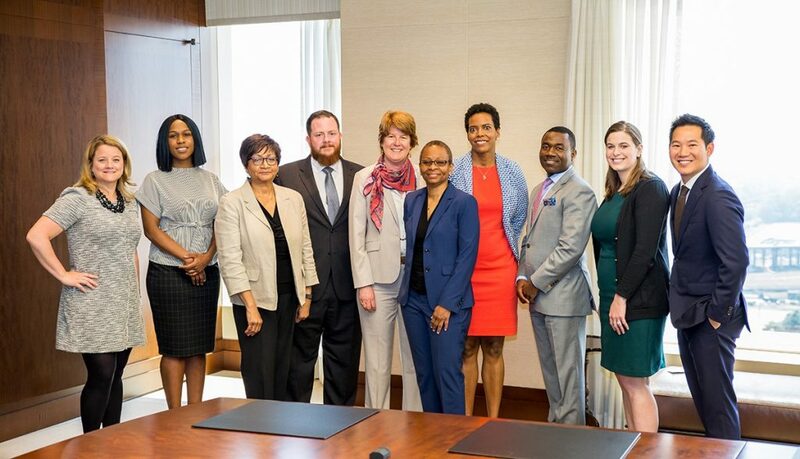 – June 7, 2018 – BurgherGray LLP, a New York City based minority-owned law firm with deep experience in structured finance and securitization, was selected by Hunton Andrews Kurth LLP as subcontractor to support the firm’s legal work advising the Government National Mortgage Association (Ginnie Mae) on matters related to the agency’s mortgage-backed securities and multiclass securities programs. Under the mandate, lawyers from BurgherGray will provide legal support services to Hunton Andrews Kurth in its five-year contract with Ginnie Mae, a wholly owned corporation of the U.S. Department of Housing and Urban Development. “BurgherGray is excited and very grateful to have been selected as a partner in this innovative collaboration to deliver best value for Ginnie Mae while advancing its legal supplier diversity objectives” said Gopal M. Burgher, a structured finance and securitization practitioner and Managing Partner of BurgherGray. Ginnie Mae recently granted Hunton Andrews Kurth a five-year contract for the client’s MBS and multiclass securities programs. Although Hunton has represented Ginnie Mae on the multiclass program since 1994, the most recent contract award was the first time that Ginnie Mae selected Hunton as its sole legal advisor. With twice the usual volume of work expected, Hunton issued a request for proposals to multiple minority-owned law firms to solicit subcontractor support. At Hunton’s invitation, BurgherGray responded to the RFP and was one of only two such law firms selected to work with Hunton on the Ginnie Mae programs.